The M24 Chaffee is an American tier 5 light tank. The vehicle was intended as a replacement for the M3 Stuart. The M24 entered service in September 1943. They were produced at Massey-Harris and General Motors factories until July 1945, with a total of 4,731 vehicles manufactured. 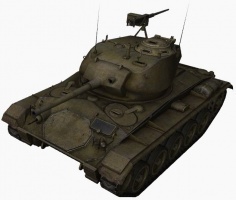 Overall, the Chaffee is a very powerful Tier V light tank that can take on the scout or flanker role. It can also take out artillery easily with its high DPM, good accuracy, and maneuverability. It is best used for harassing and damaging enemy vehicles, and then moving behind cover, especially in city maps or maps with a lot of cover. 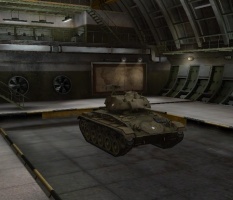 The M24 Chaffee leads to the M41 HMC, and the T37. Somewhat high profile for its tier. Poor elevation for a light tank of this type. 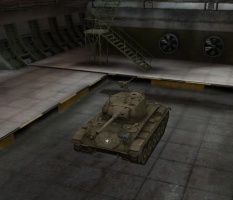 The spotting range of the Chaffee is good, making this tank a perfect passive scout. While its 96mm of armor penetration does not compare to the 137mm of penetration it had before or the 170mm of penetration the ELC AMX has, it is comparable to vehicles such as the Leopard. The Gun 75mm M6 and the upgrade, Gun 75mm M17, are welcome upgrades to the 37mm guns the M5 Stuart has. The 75mm gun's versatility is easier to note. Although still insufficient against the front armor of many tanks, it is still more than sufficient for the side and rear armor of heavier vehicles. In addition, it has much-improved alpha and a much larger HE shell, making it far more useful when fighting very lightly armored or heavily armored vehicles. It also has a good continuous rate of fire, meaning that in a light tank melee, it will quickly reduce opposing Tier V lights. As a result, it is highly suggested to get the M17 gun. 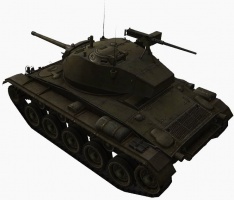 However, its armor is much thinner and its silhouette much taller than its contemporaries, and the only real protection afforded to the Chaffee is the gun mantlet and tracks. While these may be able to glance a lucky shot, it should not be counted on, and avoiding damage should be the main objective of staying alive in a Chaffee. The Chaffee can do this by passive scouting. 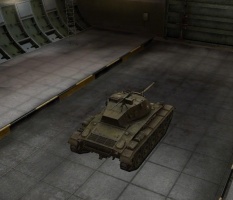 With its small size, light tank camouflage bonus and excellent view range, comparable to Tier IX and Tier X tanks, it can spot entire columns of enemy tanks while remaining hidden, allowing sniping tank destroyers and artillery to demolish the assault column so you can savage the wounded afterwards. Alternatively, its immense speed and maneuverability allow it to function well as an active scout. Taking little-used side routes, it can quickly sneak its way around battle lines, destroying isolated opponents along the way, such as opposing scouts, tank destroyers, stragglers and artillery. With its view range and radio it can cover large swaths of the battlefield very quickly, detecting advancing or camping opponents and relaying large amounts of information back to the team for strategy to be devised. Chaffees in the right hands can and will contribute to team victory. 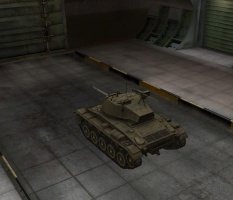 Although it lacks the derp power of an ELC AMX or the blistering shredding power of the Leopard, it has a medium tank gun that is superior to even the stock cannon on the Sherman, and is a very flexible light tank. Able to adopt any pressing combat role of a light tank and fulfill it successfully, it is a vehicle whose utility increases towards the end. Both the Wright Continental R-975C-4 engine and the SCR 528 radio transfer over from the artillery line, and the engine is shared with the medium tank line. The radio is also shared with the mid-high tier American TD line. Install these immediately if you have them. If you do not have the SCR 528, an SCR 506 will suffice. If you do not have any of these modules, get the engine first, since having powerful engines are vital to light tanks. If it was not installed already, research the SCR 528. Research the upgraded suspension for additional load capacity and traverse speed. Then go for the second turret and the M17 gun. The Light Tank M24 was an American light tank used during World War II and in postwar conflicts including the Korean War and with the French in the War in Algeria and First Indochina War. In British service it was given the service name Chaffee, after the United States Army General Adna R. Chaffee, Jr., who helped develop the use of tanks in the United States armed forces. Combat experience indicated several shortcomings of the Light Tank M3/M5, the most important of them being weak armament. The T7 design, which was initially seen as a replacement, evolved into a mediocre Medium Tank M7 and was eventually rejected in March 1943, which prompted the Ordnance Committee to issue a specification for a new light tank, with the same powertrain as the M5A1 but armed with a 75 mm gun. In April 1943 the Ordnance Corps together with Cadillac division of General Motors started work on the new project, designated Light Tank T24. Every effort was made to keep the weight of the vehicle under 20 tons. The armor was kept light, with the glacis plate only 25 mm thick (but sloped at 60 degrees from the vertical). A new lightweight 75 mm gun was developed, a derivative of the gun used in the B-25H Mitchell bomber. The gun had the same ballistics as the M3, but used a thinly walled barrel and different recoil mechanism. The design also featured wider (16 inch) tracks and torsion bar suspension. It had relatively low silhouette and a three-man turret. On October 15, 1943 the first pilot vehicle was delivered and production began in 1944 under the designation Light Tank M24. It was produced at two sites; from April at Cadillac and from July at Massey-Harris. By the time production was stopped in August 1945, 4,731 M24s had left the assembly lines. Some of them were supplied to the British forces. 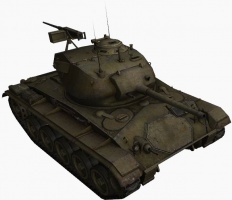 The M24 Chaffee was intended to replace the aging and obsolete Light Tank M5 Stuart which was used in supplementary roles. The first thirty-four M24s reached Europe in November 1944 and were issued to the U.S. 2nd Cavalry Group (Mechanized) in France. These were then issued to F Company, 2nd Cavalry Reconnaissance Battalion and F Company, 42nd Cavalry Reconnaissance Battalion which each received seventeen M24s. During the Battle of the Bulge in December 1944, these units and their new tanks were rushed to the southern sector; two of the M24s were detached to serve with the 740th Tank Battalion of the U.S. First Army. The M24 started to enter widespread issue in December 1944 but they were slow in reaching the front-line combat units. By the end of the war many armored divisions were still mainly equipped with the M5. Some armored divisions did not receive their first M24s until the war was over. Reports from the armored divisions that received them prior to the end of hostilities were generally positive. Crews liked the improved off-road performance and reliability, but were most appreciative of the 75 mm main gun, as a vast improvement over the 37 mm. The M24 was not up to the challenge of fighting German tanks, but the bigger gun at least gave its crews a chance to fight back when it was required. The M24's light armor made it vulnerable to virtually all German tanks, anti-tank guns, and hand-held anti-tank weapons. The contribution of the M24 to winning the war in Europe was insignificant, as too few arrived too late to replace the worn-out M5s of the armored divisions. 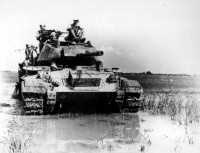 In the Korean War M24s were the first U.S. tanks to fight the North Korean T-34-85s. The M24 fared poorly against these much better-armed and armored medium tanks. 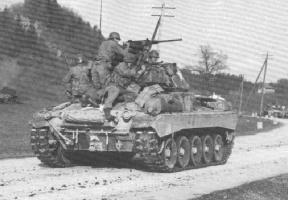 M24s were more successful later in the war in their reconnaissance role, supported by heavier tanks such as the M4, M26, and M46. 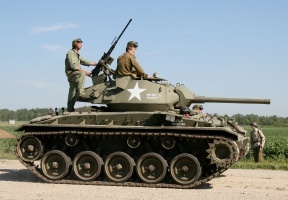 Like other successful World War II designs, the M24 was supplied to many armies around the globe and was used in local conflicts long after it had been replaced in the U.S. Army by the M41 Walker Bulldog. France employed its M24s in Indo-China in infantry support missions, with good results. They employed ten M24s in the Battle of Dien Bien Phu. 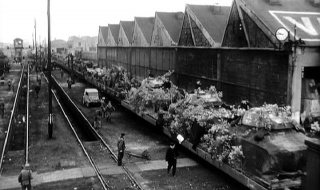 In December 1953 ten disassembled Chaffees were transported by air to provide fire support to the garrison. They fired about 15,000 shells in the long siege that followed before the Viet Minh forces conquered the camp in May 1954. France also deployed the M24 in Algeria. The last time the M24 is known to have been in action was in the Indo-Pakistani War of 1971, where some 66 Pakistani Chaffees stationed in Bangladesh were easy prey for Indian Army T-55s, PT-76s, and anti-tank teams. Although both Iran and Iraq had M24s prior to the Iran–Iraq War, there is no report of their use in that conflict. - Light Tank T24 - prototype, was standardized as Light Tank M24. - Light Tank T24E1 - prototype with Continental R-975-C4 engine and Spicer torque converter transmission. One vehicle was converted from the original T24 prototype and tested in October 1944. The vehicle had superior performance compared to the M24, but suffered from transmission reliability problems. - M19 Gun Motor Carriage Engine moved to the center of hull, twin 40 mm M2 AA mounted at hull rear (336 rounds). 904 were ordered in August 1944, but only 285 were delivered. - M37 105 mm Howitzer Motor Carriage Carried a 105 mm howitzer M4 (126 rounds). Was intended to replace the 105mm Howitzer Motor Carriage M7. 448 ordered, 316 delivered. - M41 155 mm Howitzer Motor Carriage (Gorilla) Engine moved to the center of hull, 155 mm howitzer M1 mounted at rear. 250 ordered, 60 delivered. - T77 Multiple Gun Motor Carriage. Had 6 .50 caliber machine guns mounted in a new designed turret. - T9, T13 Utility vehicles. - T22E1, T23E1, T33 Cargo carriers. - T42, T43 Cargo tractors. Based on the T33, the T42 had a torque converter transmission from the M18 Hellcat. The M43 was a lightened version of the T42. - T9. Had bulldozer kit installed. - T6E1 Tank recovery vehicle. - The M38 Wolfhound prototype armored car was experimentally fitted with an M24 turret. - M4 Earth Moving Tank Mounting Bulldozer. Bulldozer kit for the M24 series. - NM-116. In 1972 the Norwegian Army decided to retain 54 of their 123 M24 light tanks as reconnaissance vehicles after they were substantially rebuilt under the designation NM-116. It was calculated that the NM-116 rebuilding program cost only about a third as much as contemporary light tanks. This program was managed by the firm Thune-Eureka. The American firm NAPCO developed an improved power-pack based around the 6V53T diesel engine used in the M113 armored personnel carrier mated to an Allison MT-653 transmission. The original 75 mm Gun M6 L / 39 was replaced with a French D-925 90 mm low pressure gun, with a co-axil M2 .50-caliberheavy machine gun. The bow gunner position was eliminated in favor of ammunition stowage. A new fire control system was installed, complete with a Simrad LV3 laser rangefinder. Norwegian firms also converted eight M24 light tanks into light armored recovery vehicles to support the NM-116. The NM-116 were retired from service in 1993. 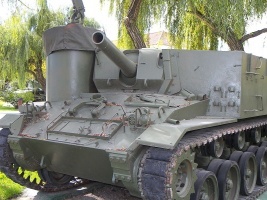 - The Chilean Army up-gunned their M24s in the mid-80s to the IMI-OTO 60 mm Hyper Velocity Medium Support (HVMS) gun, with comparable performance to a standard 90 mm gun. Chile operated this version until 1999. - Uruguay continues to use the M24, modernized with new engines and 76mm guns which can fire armour-piercing, fin stabilised, discarding sabot (or APFSDS) rounds. 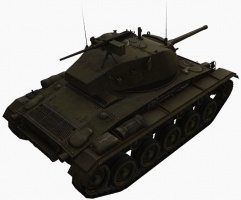 - In mid-1950s, in an attempt to improve the anti-tank performance of the vehicle, some French M24s had their turrets replaced with those of the AMX-13 light tank. Interestingly, AMX-13 variant with Chaffee turret also existed. The Chaffee's actual top speed is 56 km/h (currently 62 km/h). These two volumes are widely regarded as the definitive reference works on the American Light Tanks. Volume-1 covers the real life counterparts of the in-game light tanks: T1, T2/M2, M3, and M5 series and the T21 and the M24. This page was last modified on 25 March 2019, at 15:16.